Groombridge is a beautiful example of a Georgian House. The earliest mention of one on this site is from 1239, when the Lordship of Groombridge was granted to William Russell. By the mid 14th century, the lands were held by Sir John de Clinton, whose grandson, Lord Clinton and Saye, sold Groombridge to Thomas Waller of Lamberhurst c.1400. One persistent legend which dates back to that time is that of a tunnel between the cellars at Groombridge Place and those of the nearby Crown Inn, although no such tunnel has ever been found. Groombridge Place has remained largely untouched since it was built over 350 years ago, and is now privately owned and not open to the public. You may visit the gardens for a fee. 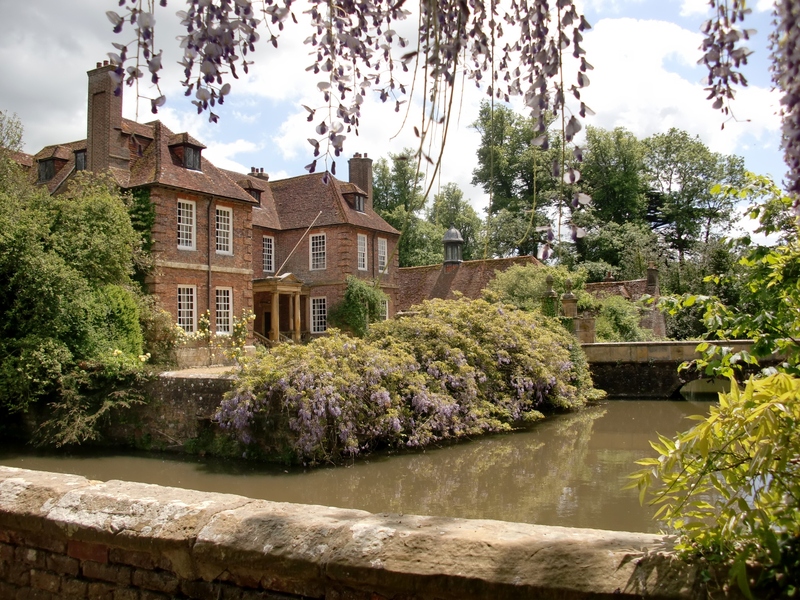 Groombridge Place was chosen to portray Longbourn in the 2005 film version of Pride & Prejudice, starring Keira Knightley and Matthew Macfadyen. It was chosen because it reflected the faded grandeur of a well to do family that had fallen on hard time. It depicts Longbourn at the time Jane Austen first penned Pride & Prejudice, then titled First Impressions, in 1796/7. The production company had to change the windows, build a duck bridge over the moat, and bring in the animals and mud for the outside shots of the courtyard. Thankfully the cast did not stay here, but were ferried to and from their luxury hotel to private Winnebago’s, which were parked of set in the quarry. Here are a few pictures of then and now. Keira talking to Joe Wright, the director. The scene where Mr Bennet (Donald Sutherland) tells Elizabeth she does not have to marry Mr Collins, is filmed at the same spot as where Mr Bingley practices his proposal to Jane on Mr Darcy. However, in the picture below you can see that this area has become neglected and overgrown. You can just about distinguish the roof line of the building behind and the same bent branch as in the above pictures. So overgrown you can no longer see the water. The Bennet family wait for Lydia. In this picture we see Elizabeth cross the purpose-built duck bridge, walk through the washing and around to the front of the house. But if you look closely at this aerial shot, you can see that the duck bridge (on the right and still there today) is actually at the back of the house. There is no access to this part of the building, which is why I used the aerial shot. It is a nice overview of the whole house too. It is a shame that the house is not open to the public at any time. The house is as much a leading character of the 2005 film as Miss Knightley and Matthew Macfadyen. With so many fans wishing to visit and walk in Elizabeth Bennets footsteps, I am sure it would be a profitable venture for them. However, for now it is a private home and we must respect that. You must take a turn in giving out the candy.